Spring is in the air! 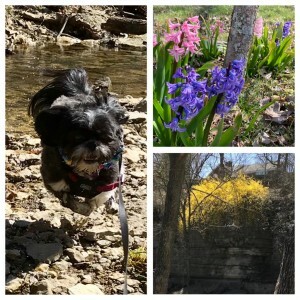 Pippin, our beloved yoga dog, is leaping (or flying) with joy on a recent spring hike. The purple and pink hyacinths are blooming in my front yard and Saundra Dockins snapped the beautiful photo of the yellow forsythia in Cherokee Park. Spring offers us a multitude of ways to experience ananda (joy and bliss) outside. But as you venture outside, make sure you also take time to venture inside to tend your Heart and reunite with the ananda within. Infinite Bliss has several activities planned this month – both outside and inside – check them out and join us! Also, our next Anusara Yoga Immersion series is now scheduled – it is a yoga journey you won’t want to miss.